Dressage and Natural Horsemanship are both about training horses, it could be argued that the difference is only in what we are training the horse to do. However the real distinction is much more profound. The difference actually lies in how we are training the horse to do what we want him to do. What we subsequently train him to do then goes hand-in-hand with this fundamental approach. What we refer to as 'real dressage' is the gymnastic development of the horse to carry himself using a specific system of muscles, which results in a dynamic of balance, power and strength between horse and rider. 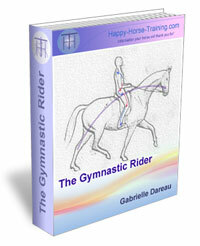 The way that we train the horse to use this system of muscles is equally primarily physical or gymnastic - that is to say, the communication between rider and horse takes place through contact, whether it be via pressure or weight distribution, in their many different forms. 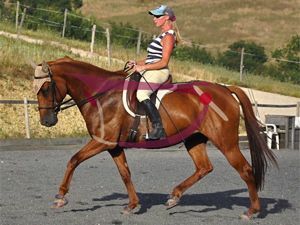 This is not to say that there is not a profound conscious connection between horse and rider in Real Dressage, but this comes about as a result of the gymnastic harmony achieved through training. The difference between dressage and natural horsemanship is that natural horsemanship sets out to communicate cognitively with the horse. This means that the horse is trained by conditioning certain responses to certain signals. These signals are very often given at a distance by the trainer, and therefore involve no physical contact. It is the horse's mind that is being trained to react, not his body that is being encouraged to function in a particular way. The methodology of some schools of natural horsemanship is to tap into the horses natural apprehension of certain stimuli - such as a swinging rope, a bag on the end of a stick, or forms of body language - and to increase the stimulus until the desired reaction is obtained from the horse. Then the stimulus is removed, and this becomes the reward for the desired response. With repetition, the horse becomes more and more quick to anticipate the signals, because the state of apprehension that he is being put into lends itself to this. These kind of stimuli bring about the same response as the threat from either predators or the aggression of a more dominant horse in the horse's wild state, hence the tension that they provoke. In fact, this response to the aids is not really the point of dressage, there is a whole other dimension to it. The fact that the horse yields to the aids means that he is then using his body in a way that strengthens certain muscles and supples certain joints. The yield response also goes along with a definite physical and mental relaxation of the horse. The horse's whole body starts to work together to support him and his rider in this way of going, and therefore it gets physically easier for him to yield to the rider's pressure, weight and posture aids, thus requiring progressively less aiding from the rider. This different way that the horse uses his body forms a specific pattern in the central nervous system, commonly known as muscle-memory, which is a profound change in the functioning of the nerves, and goes hand-in-hand with the muscular development that takes place as a result of good training. 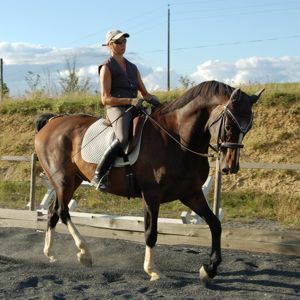 So the reason that a highly trained dressage horse responds to the slightest indication from his rider is NOT because he has learned to, it is because it has become physically very easy and comfortable for him to correspond to his rider's wishes. It is the same way that a tennis player who hits the ball perfectly can place it with incredible precision (and power) on the court. The energy of motion is completely channeled and therefore becomes accessible, in just the same way as the energy from the horse's hind-legs becomes accessible to the rider when the horse is straight and engaged. Yes, there may be a certain level of cognitive learning of signals that happens inadvertently, but this is not the real goal of dressage. The difference between the training methods of dressage and natural horsemanship, in its most commonly used form, is that this kind of natural horsemanship is based on getting results from a state of mental tension (which also results in physical tension), from anticipation and apprehension, whereas correct dressage uses the horses natural tendency to yield to physical pressure in order to physically develop him in a particular way that subsequently makes it easy for him to listen to the slightest signal from the rider's body. The irony in this is that modern dressage actually employs to a great extent the methodology of natural horsemanship, instead of that which has just been described as correct dressage. 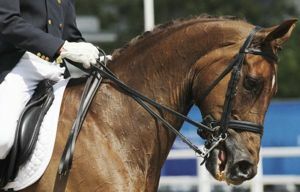 The overriding perception in dressage is that the horse must be trained to respond to certain signals by performing certain actions. 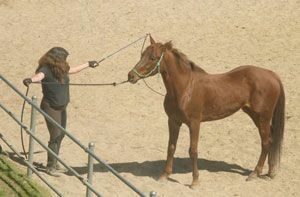 This can be done just as effectively in the saddle with spur, whip and double bridle, as on the ground with a rope. The difference between this and real dressage again comes down to tension. In this kind of dressage riding, the horse is put in a state of apprehension by the use of equipment that makes him afraid because he knows it can cause him extreme discomfort. Especially since he is literally trapped between the spur/whip and the extremely powerful double bridle. This state of mental tension puts him on red-alert to react to the rider's signals, and he quickly learns that when he responds in a certain way he endures less discomfort. Horses have an incredible capacity to learn in this way, perhaps because their original wild state required not only a very good memory to keep track of their surroundings, but also demanded that they learn immediate responses to danger signals to escape predators. This is perhaps why it is possible for a horse to learn to perform the complexity of a Grand Prix dressage test almost by rote, given only queues by the rider. Unfortunately this is not what dressage is really about. Instead this is a form of circus-trick training which turns the horse into a robot, as over the years of training the tension transforms into mental detachment and physical stiffness. 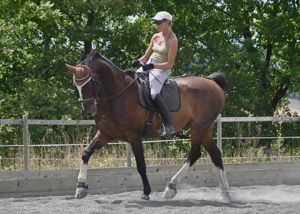 In this way modern dressage and natural horsemanship have a lot more in common than meets the eye. 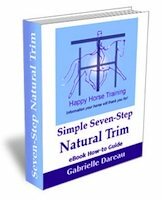 Although the trappings and the tricks may differ, the approach of this kind of dressage and natural horsemanship is essentially the same. Why Is Real Dressage So Different From This? When we can get out of the mindset that we are conditioning the horse to give us certain responses, and start to develop his body gymnastically, we realize that the moments when it feels the best - the most perfect balance and togetherness - are the moments when we feel like we could ask the horse to do anything in that instant. Nothing to do with pressing some magical 'button' to get a pre-programmed response, but because it would be physically possible and easy for him to it. This is because true engagement leads to a state of physical equilibrium in which there is great potential, potential for power, for collection, for change of direction, to stop or to go. When as a rider you succeed in getting the horses hind-legs channeled so that their power is transmitted directly through the horse's body, without loss of balance, it is as if you have plugged into a power socket. This has nothing whatsoever to do with the dull, lifeless feeling you get from riding a 'schoolmaster' who knows all the tricks, and is only waiting for you to press the right button for him to reel them out. A passage that happens spontaneously when you move your legs back to a certain place and bang them alternatively against the horses sides, despite the fact that there is no true gymnastic connection between you and the horse, is not a real passage and has no merit other than entertainment value. 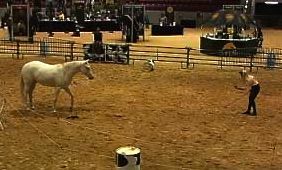 You can teach a horse to perform these kind of tricks from almost any signal, visual, vocal or sensory. There are people who perform so called 'natural dressage' without saddles or bridles, but with the same conditioning to signals. They may not, in this case, be restraining the horse physically, but the restraint of mental tension is still there, and can be seen in the automaton-like, stiff way that the movements are performed. Only gymnastic training, which comes from understanding the right way to influence the horse with your posture, can result in the suppleness and fluidity of movement that is truly beautiful, no matter what the level of training. This is why we cannot really seek a distinction between dressage and natural horsemanship, or between different schools of dressage. Although it is true that the Classical ideal was founded on the use of the seat and aiding to train the horse, there was very probably just as much conditioning through tension in the dressage of the 'old masters' as there is in modern competitive dressage. The real difference is in whether we are embracing the present moment when we ride or not. When you are riding for the greatest perfection of balance in every moment then you have no concern for teaching the horse a response to a signal which it will repeat ad-infinitum, in fact, in your training you are constantly un-doing these learned responses in the horse, so that the greatest potential is always available in each moment, and the horse is truly one with you. This is the irony, that many so-called schoolmasters have stopped actually listening to their riders, they are just interpreting commands on auto-pilot, and if a rider should try to connect to them gymnastically, there is nothing there, no response. To take the subject to its most profound level, this distinction between training through mental tension and staying in the moment, is the embodiment of being either in an ego-state or not. 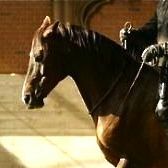 The ego state is founded on fear, and this is why it is attracted to creating time-based dynamics such as learned responses, because they provide a kind of security ('If I can be sure my horse will perform a series of changes when I poke him alternatively with each spur, then I can be sure not to make a fool of myself'). This reflects the idea that only negative states of mind, such as tension, have inertia, or are lasting. This is because they are an energetic contraction - a fixing or resistance. This explains why traumatic experiences are so often retained over a lifetime, only requiring a certain stimulus to trigger the original response; whereas positive states always seem to be more fleeting - they come and go, but you can't hold onto them. Similarly in training, responses that are learned by the horse in a state of tension are retained mentally in a very effective way, so that the slightest associated stimulus is enough to trigger the response. The other side of the coin is that any action the horse performs physically in a state of tension, cannot fundamentally re-pattern the central-nervous system in the same way as happens when the horse is working in relaxation. This is because it is not possible biochemically for nerves and muscles to grow when the cells are in 'stress mode'. The non-ego state, or the real self, knows that everything is available in every moment, that this is where the potential for all possible action and expression exists. Therefore it seeks to access this by embodying a state of balance in every moment. This is an expansive state, based on continuous renewal, flow, and potential for change, which inevitably leads to creativity, beauty, and healing. Hence the power of engagement to manifest all three. The paradox here is that although when you begin to ride in the 'now', the good moments seem to come and go, it is only this way that you can actually achieve true consistency in the end, as well as profound physical transformation, and the confidence to know that you can always find that deep connection, both gymnastic and conscious, with your horse. Of course both dressage and natural horsemanship can be done in this way, it is simply up to the trainer to choose where their real motivations lie. Just as there is dressage training going on which is founded on the sensitive gymnastic development of the horse, there is also natural horsemanship which promotes relaxation and trust, and as a result a genuine learning process for the horse. 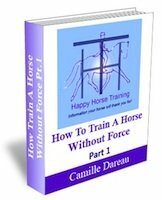 How To Train A Horse Without Force What is Real Dressage Riding?